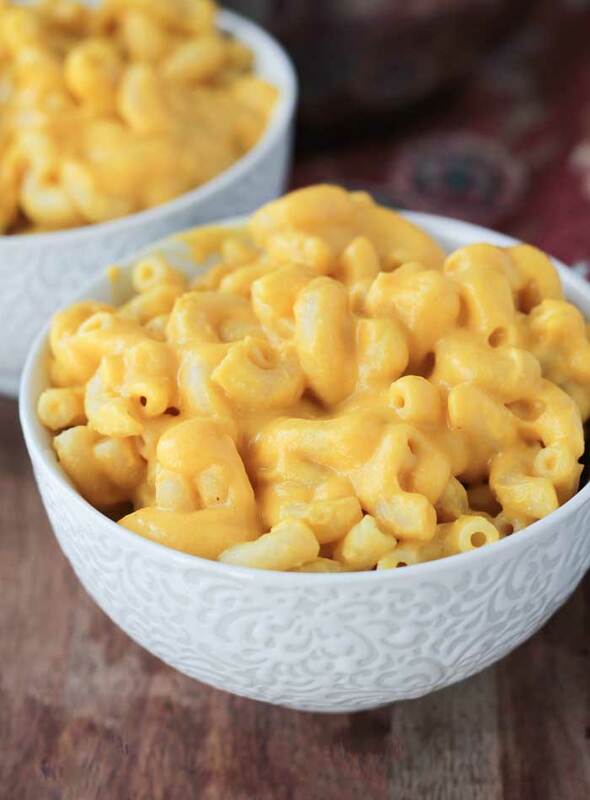 Butternut Squash Mac and Cheese – The PERFECT vegan mac and cheese! You will not believe how good this is!!! No soy, fake cheese or nutritional yeast. Update January 2017: This recipe was featured on The Doctors tv show. Watch me talk about the recipe with Dr. Travis and see the results of a LIVE kids taste test here! It was National Noodle Day yesterday. I was hoping to have this post ready for that, but after a super fun high school reunion this weekend, it just didn’t happen. So here ya go…why not celebrate noodles two days in a row?! Especially with this delicious dairy free Butternut Squash Mac and Cheese! 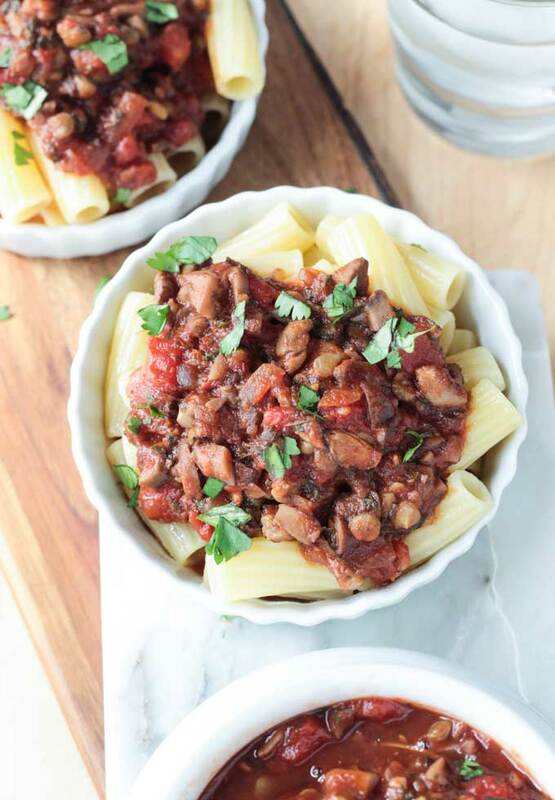 Pleasing vegans, omnivores, adults, and kids alike, this is one creamy pasta dish you don’t want to miss! 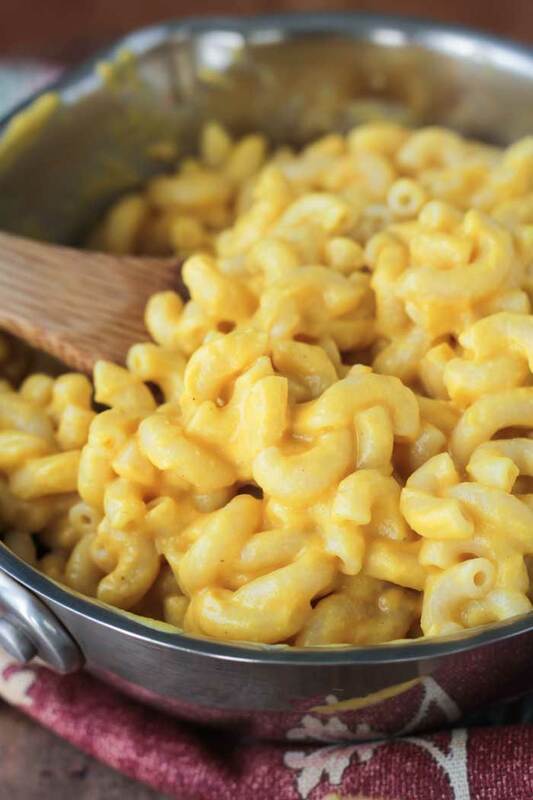 My kids (who are not vegan) love Mac and Cheese…you know, the store bought blue box kind of Mac and Cheese. They don’t even like the yellow box with shells stuff. It has to be the small elbow macaroni noodles with a thin golden yellow-orange color. I switched to an organic brand a long time ago, but let’s face it, it’s still processed and not healthy. Every time I try to make a homemade vegan mac and cheese, the kids groan. And to be quite honest, I haven’t liked them either. 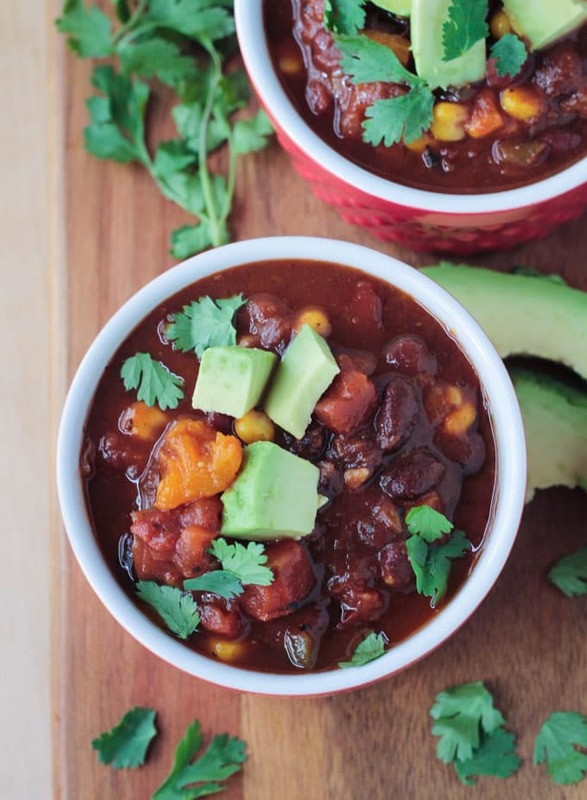 A year ago, I finally made a plant based version that I thought was absolutely delicious. The kids liked it a lot, too. Well, I’ve made several tweaks to that recipe to make it quicker and easier and I’m telling you it looks just like the Kraft stuff. I actually told my kids the other day that it was mac and cheese. M said, “the one I like”? “Yup!” I said, holding my breath as he tried it. He asked for seconds…and thirds! The girls both had seconds as well. Fyi, I use that little trick all the time to get them to try things. A little white lie never hurt anyone, right? Right? This Butternut Squash Mac and Cheese is super healthy. It’s made from only whole food plant based ingredients. Butternut Squash is high in Vitamin A, C, several B’s, K and fiber. It has anti-inflammatory and antioxidant properties and may help regulate blood sugar. Paired with sweet onion, protein packed cashews and some spices, it’s a match made in vegan heaven! I love this sauce so darn much, that I’ve created several other recipes with this sauce as an inspiration. 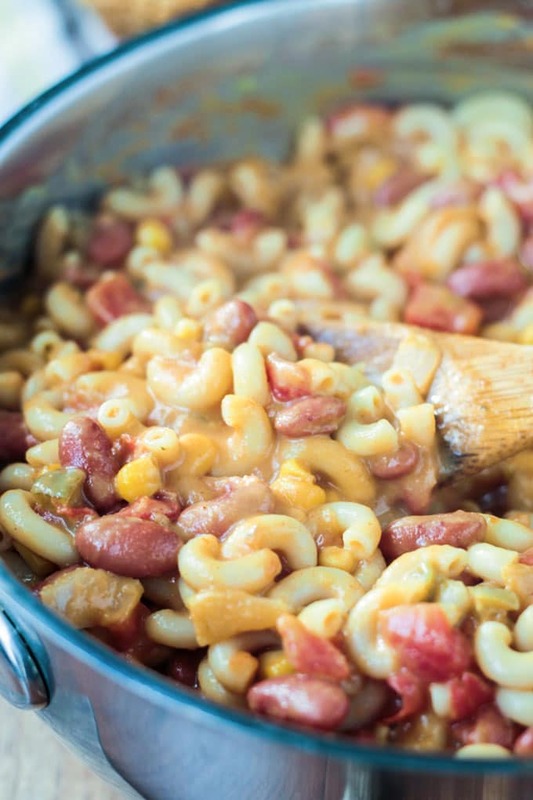 So, if you’re a fan of this creamy, dreamy, dairy free mac and cheese, you’re also gonna love my Baked Buffalo Chickpea & Artichoke Vegan Taquitos, Vegan Broccoli Cheese Soup, Easy Cheesy Chili Mac, and my just-like-the-jarred-stuff Vegan Queso! 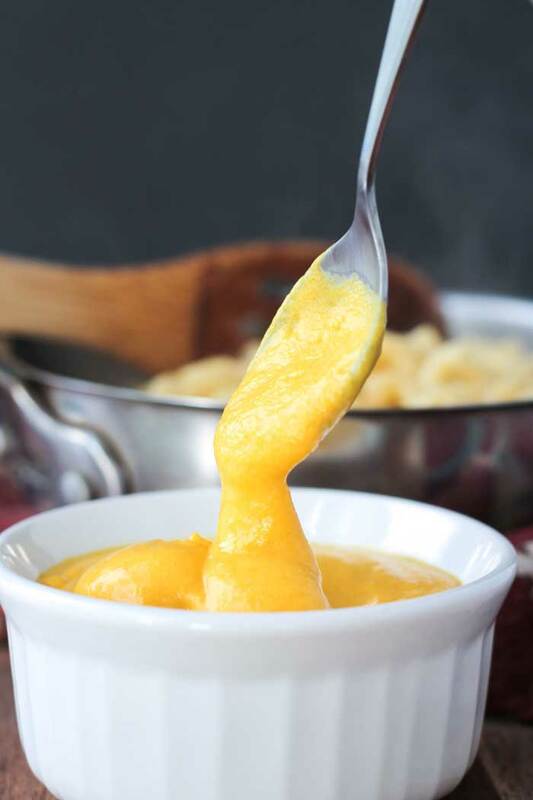 You guys must try this Butternut Squash Mac and Cheese. I promise you will love it! Please come back after you try it and leave me a comment below with your feedback and star rating! You can also find me on social media. Be sure to tag me @veggie_inspired and #veggieinspired so I don’t miss your post! Now run to the kitchen and make this now! 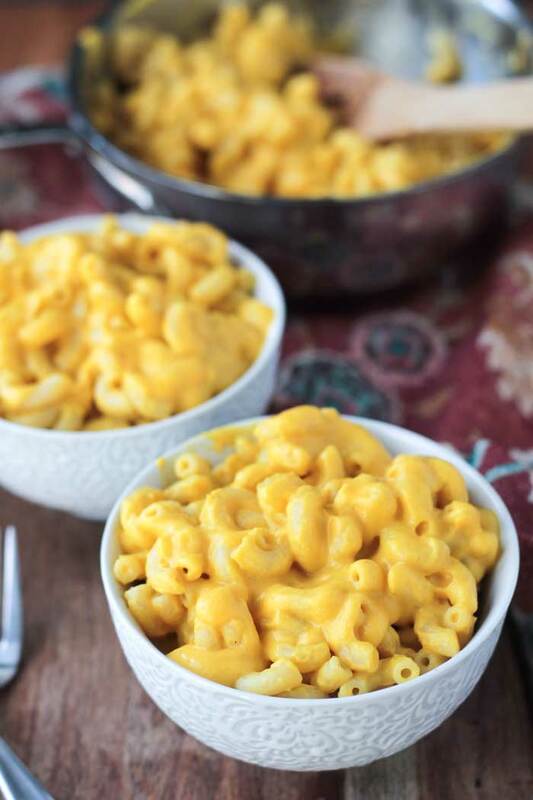 Butternut Squash Mac and Cheese - this is the BEST vegan mac and cheese you'll ever have! Made from all whole food plant based ingredients, it's healthy for you too! Kid approved! Add butternut squash and onions to a pot and cover with water by at least an inch or two. Bring to a boil, turn down heat to medium and simmer until vegetables are tender (about 15 minutes or so). Meanwhile, cook macaroni noodles according to package directions. Reserve 1/4 cup cooking liquid once noodles are done cooking and before draining. Place noodles back in pot and set aside. When squash and onions are tender, drain (reserving 1/4 cup liquid - unless you are reserving the liquid from the noodles), and add them to a high speed blender with the cashews, lemon juice, salt, dijon, garlic powder, black pepper, smoked paprika, turmeric, nutmeg and reserved cooking liquid from either the noodles or the squash. Blend until completely smooth. Use a tamper if necessary to push ingredients to the bottom of the blender. Add butternut squash sauce to the macaroni noodles and stir, making sure every noodle is covered in sauce. Warm through if needed. Thank you, Debbie! So happy to hear this! Fyi, the sauce is great on a baked potato topped with roasted broccoli, too!! I made it and it was fine but the sauce didn’t turn out creamy at all so I didn’t really enjoy it. I followed the recipe but is the butternut squash supposed to be really soft after it’s done cooking? It was still kinda hard so maybe I didn’t cook it right? It also could be the blender but I tried putting the sauce ingredients in a food processor which helped blend it, but didn’t help turn it out creamy. Hi, Laura. Yes, the butternut squash should be very soft. You should be able to pierce it easily with a fork or knife. The smaller you cut the squash, the quicker it will cook. Sounds like it just needed more time. Also, a high speed blender, like a Vitamix or Blendtec, is going to be best here. A food processor probably won’t be able to get it as smooth. For those on dialysis, this is great recipe except for the cashews. Can those be eliminated? I’ve had many readers replace the cashews with an equal amount of white beans. Or you can just leave them out, but it won’t be as creamy. Great recipe. I double the recipe when I make this and add 1/4c nutritional yeast and a half of a seeded jalapeño peper for a little heat. Thanks, Matt! Love the addition of the jalapeño! I have made this a ton of times for my toddler but this time our 10-month-old got to join in on the party and I swear between the two of them they ate half the pan! Such a great recipe. I always use more squash and double all the spices. I top it with panko and vegan butter and give it a quick broil, too! LOVE that your kiddos love it! Turning it into baked mac and cheese sounds like a great idea! Thank you for your comment, Erin! I loved this recipe. I felt a guilty kind of pleasure eating it but then remembered it wasn’t actually unhealthy. So happy you loved it, Marianna! Pretty good. Nice texture. Pretty good flavor, too, though I used canned pumpkin and maybe should have added in more of the spices. I’ll admit I eyeballed the measurements. Maybe I need reading glasses? Also, I sauteed the onion with a clove of garlic in a very wee bit of olive oil before tossing it into my regular old food processor with the other ingredients. I had soaked the cashews for maybe 5 hours since I don’t have a high powered machine. Success! Happy to hear you liked it, Betty! I used half of a roasted butternut squash that we had left over for this and it came out great! My 12 month old loved this and she has been a picky eater lately. I left out the onions, since I didn’t have any cooked and doubled the cashews. Out of the blender the cheese mixture was kind of sweet and tastes like a delicious butternut squash mousse. I’m thinking maybe I could use it for some kind of dessert. I’m also curious to try it with the onions next time! So happy to hear you guys loved it, Sarah! Butternut squash mouse is an interesting idea! Might have to play around with that one…. Would the sauce be good to make extra and keep it in the fridge or Freezer? Hi, Erika. I have never tried freezing it, but I don’t see why it wouldn’t work. It will keep in the fridge for several days for sure. Enjoy! First of all, this was delicious! We loved it (including a discerning 8-year-old). I don’t think it should be called Mac and Cheese, however, as it tastes nothing like it. Just Butternut Mac would be accurate! Thank you! So glad you all enjoyed it, Molly. Thank you! Sour? The dijon would help balance that, but I’ve left out the dijon before and it definitely didn’t taste sour. Maybe your lemon/lemon juice was bad? Or maybe you are just sensitive to the “sour” in lemon? I’m not sure otherwise…I’ve never had anyone have this problem before. Just made this for dinner with some veggie burgers. Loved the recipe! Even my boyfriend and his son enjoyed it and they tend to be a little picky when it comes to vegan anything. There were a couple seasonings I didn’t have but just used something as similar as I could. Turned out great! Definitely keeping this recipe. I see myself using this every week haha! Wonderful! Thank you, Alyssa! So happy to hear you all loved it! I’m making this today and plan to freeze some in Mason Jars! Do you think this would freeze well/ how long will it keep in the fridge? Thank you! Can’t wait to make this! I have never tried freezing it, but I would guess that it work just fine. It will keep in the fridge for 3-5 days. Enjoy! I was curious if I sauteed some butter nut squash (small cubes) and add it in with the macaroni and bake it , will it completely change the consistency? I was thinking of maybe making another cheese mixture and adding it over top before I bake it. I am trying this for thanks giving tomorrow. I usually make backed macaroni and cheese, but now that I am vegan, I wanted to try this recipe baked lol. Others have baked this recipe with great success and said it was perfectly saucy. Personally, I would maybe do at least 1 1/2 times the sauce recipe if baking to make sure it’s saucy enough. If you are making more sauce than the recipe, however, don’t add extra dried mustard or nutmeg – those can get overpowering. Enjoy! Do you know if pumpkin could work instead of the squash? Not sure how to get my hands on butternut squash where I live. Also not sure how the pumpkin would impact the flavour, since I don’t know how butternut squash tastes. Hi, Sherelle. Butternut Squash is a bit sweeter than pumpkin, but with all of the other spices, I’m not sure it would make much of a difference. Not to mention I love pumpkin sauce on pasta, so I think it would work great. Just be sure to taste the sauce before you put it on the pasta because it will be hard to adjust after. Enjoy! Thanks. I went ahead and did it before seeing your reply. It’s a hit!!! Can’t taste the pumpkin flavour at all and best of all my picky eater loves it!! I followed the recipe very closely and the flavours didn’t turn out at all! It was not very good and tasted nothing like mac and cheese. Just watery butternut squashy sadness 🙁 I really don’t know what I did different from the rest of the commenters! Hi. Did you drain the squash/onions after cooking? That’s the first thing that comes to mind because it shouldn’t be watery at all. Has anyone tried pressure canning this? I can not see how it could hurt, but before doing 21 quarts or so thought I would ask. Did a quadruple batch and noticed that in addition to cutting down on the dijon as commented I need to cut down on the smoked paprika as well. With squash season winding down and me being a cheese head, would be much easier to stick to my diet if I had cans of these on the shelf for dumping on things like broccoli, potatoes, chips, or shoot – anything where i need a cheese fix. Hi, Markus. I agree that the dijon can be overwhelming when making a double or triple batch. I haven’t tried canning anything, ever, so I have no idea how that would work, but what a great idea. If you decide to give it a go, I’d love to hear the results! Enjoy! Freezing would be safer option. Pureed squash and other pureed vegetables, and anything with thickeners/starches should never be home canned – even in a pressure canner. The temperatures aren’t able to properly distribute tbrough the food and are unlikely to kill all the bacteria and contaminants. Big bummer – because canning this sauce would be amazing! Good to know! Thanks for chiming in, Rachel! Thanks for the info! I may try one jar just for s&g. Ive canned some pretty thick stuff before like ragu sauce. We found the trick was to very slowly bring up to heat so that temperature gets equalized and start with a hot product in the first place. Not every jar pops and the ones that dont go into the freezer. My problem is when I want cheese I want it NOW and really havent found a vegan alternative that has worked for me. However, based on your comments I would not suggest anyone else try it. Off topic, I am wondering why pumpkin butter is okay but not apple butter…? I loved it, thank you. I added frozen peas to up the nutrition and add color. The recipe as written, however, is a keeper. Thank you, Sab! So glad you loved it!